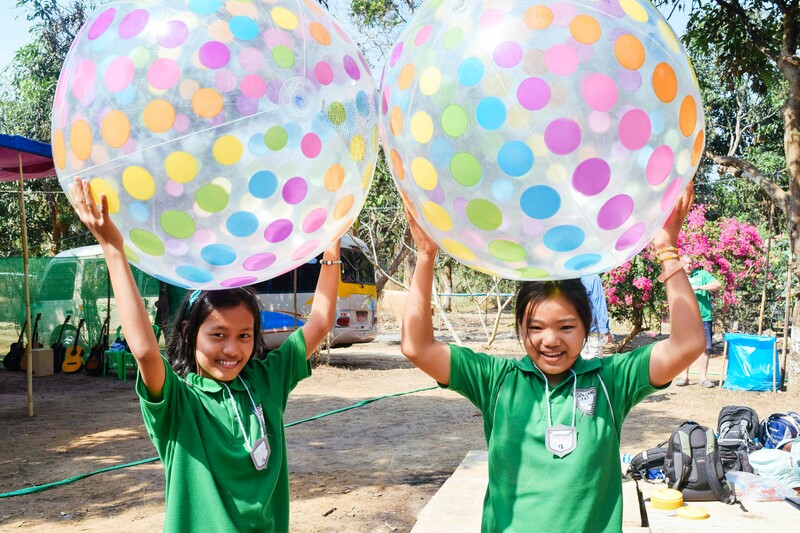 Photo: Two girls from one of our orphan homes are overjoyed to have completed final exams and enjoy an end-of-school camp hosted by our native team. We are happy to report that all 120 of our Myanmar orphans, who are in the 1st through 10th grades, completed their final exams this month. 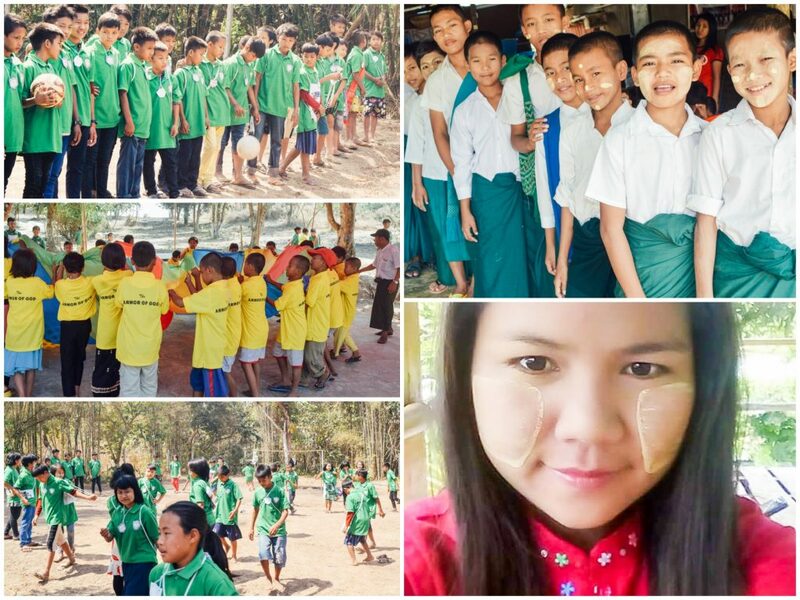 They diligently prepared for these exams by studying and receiving tutoring for their native Burmese language, English, geography, history, math, science, biology, and physics during the past semester at the different local schools where they are enrolled. 3 of the children are candidates to graduate from high school and they were very excited to take their final exams — if they pass with good scores they can attend college to further pursue a quality education. We eagerly await our students’ test scores which will be available in the coming weeks. To celebrate the beginning of the summer holiday, our native team put together a camp for 175 children (ages 2-18, divided into 4 age groups), which included the 120 children in our 6 orphan homes and some children from the local community. Our 25 volunteers led the children in fun games such as football, running races, jumping rope, and water games; creative activities such as drawing, coloring, and playing guitar; and a Bible study each day. The children learned many valuable lessons from the Bible studies, and they also learned how to work together as a team. In addition, our 5 volunteer cooks prepared a feast of various vegetables & rice dishes. In the words of our field director: “They all were happy and refreshed during this time in their life.” Our team would like to have another week-long children’s outreach camp in April to coincide with the local Water Festival — we are seeking $1,500 to be able to bless the children in this way — about just $10 per child. In other good news, out native team acquired some new land outside the city which will be our new campus — we are waiting on funds to build a new orphan home for the children. It will be our primary orphan home with many improvements and much more space. In the meantime, our team along with the children have been preparing the land for future construction by cleaning the area that was recently cleared of trees. Thus, until the permanent orphan home building is constructed, the children and our native team can utilize the new land by playing games, setting up a cooking area, and setting up a temporary camping area. Our team also planted cabbage, chilies, and eggplant on the new land and we look forward to a bountiful harvest soon as well as the continuation of a flourishing garden on our new campus. The children are so happy to be involved in spending time on the new campus as they are praying with us that the funds for the new building are provided soon. Pemala* was 13 years old when she arrived at our orphan home. Her father died of cancer when she was very young, and her mother remarried, but she and Pamela’s stepfather could not support her nor afford to send her to school. After Pemala came to our orphan home, she stayed with us for 5 years until she graduated from high school. Pemala’s favorite school subject was English, she loved to sing songs, and she loved the fresh cooked meals and fresh fruits provided to her at the home. After graduation our native team provided Pemala with a scholarship to their partner Bible college where she received a B.Th degree. There she met her fiancé who is a pastor. Pemala, who is now 25 years old, has asked our field director to travel to her wedding and stand beside her as her father, which will be a great blessing to him and to her. After Pemala and her fiancé are married, they plan to serve at a local church. Part of the core curriculum at our native team’s bible college is missional outreach, equipping students to show the communities where the graduates will serve that churches are more than religious gathering places, that they are to act as the hands and feet of Jesus, bringing healing, ending hunger, and creating tangible hope for the hopeless. We pray that Pemala will be a blessing to the countless souls she will touch in the community where she will serve alongside her husband in their new calling. Thanks to your support of our Myanmar orphan care programs, it’s stories like hers that are made possible. We are extremely grateful for your prayers and generous support making a life-changing impact in the work that we do for these children and our native teams.